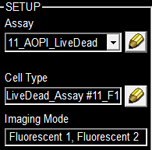 Nexcelom’s solution is to perform fluorescent based cell analysis using acridine orange (AO) and propidium iodide. Since AO and PI are nucleic acid dyes, they will bind to and label only the DNA of live and dead nucleated cells. 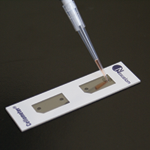 This method allows for the identification, enumeration, as well as provides cell viability of nucleated cells in any sample. 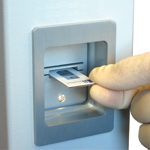 Using a Cellometer with dual fluorescence – Auto 2000, K2 or Vision – just 20 µl of sample is added to the Cellometer Counting Chamber. Imaging and analysis of the samples is completed in less than 60 seconds. Bright field and fluorescent cell images can be viewed to check cell morphology and verify cell counting. Total cell count, concentration, and mean diameter are automatically displayed. In a separate experiment, three individual human bone marrow samples were stained with AOPI, imaged and analyzed. Acquired bright-field (BR) images were counted separately from the acquired AOPI (F1F2) images. As shown in the table (right), many more particles were counted in the BR than in F1+F2. Since the count of F1F2 to BR are not 1:1, the ratio of FL /BR reflect those counts. Furthermore, the tabulated ratios in the three separate experiments are shown to be different from experiment to experiment. The ratio variation is the direct results of imaging of non-nucleated particles in bright-field. Due to the complex nature of the sample, we conclude that counting nucleated cells in a bone marrow samples should be performed using AOPI staining. Five human cord blood samples were stained with AOPI and imaged. Acquired bright-field (BR) images were counted separately from the acquired AOPI (F1F2) images. As shown in the table (right), many more particles were counted in the BR than in F1+F2. The ratios of FL to BR show that in almost every sample there was more than double the amount of particles counted in BR compared to AOPI. Variability in ratios stems from counting non-nucleated particles in bright-field. We conclude that counting nucleated cells in complex samples such as cord blood should be performed using AOPI. Above, is the representative set of 4 different mouse lymphocyte samples (Lym7, 6, 2, 5). A bright-field and a counted fluorescent image are shown for each sample. The samples ranged in concentration from 1.07x105 (with 49 cells counted) to 6.75×107 (with 24245 cells counted) and viability of samples ranged from 58.0% to 84.4%. Because images can be saved during data acquisition, they can be used for documentation and visual verification of counted cells. Below, are the tables containing the data for each of the 30 collected and processed lymphocyte and splenocyte samples. Reported below are the cell counts, concentrations, and viability for live cells. The same imaging and counting parameters were used for all samples. Total imaging time for all 60 samples was approximately 30 minutes compared to total counting time using a hemocytometer was approximately 2 hours. digest samples are collected from the patient at the primary source of the tumor. Solid tumors first need to be digested and processed before they can be utilized in experiments.